Apparently, hay fever sufferers make dangerous cyclists, as if they sneeze they oftentimes send themselves careening into ongoing traffic. 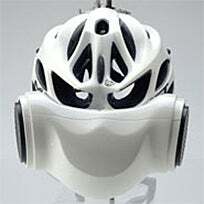 Solving that problem and also making cyclists look totally badass is this Breathe Air helmet. It's got a filter over the nose and mouth that's designed to filter out particles that will cause problems for people with allergies and asthma. Oh, and you'll look like you just biked out of a sci-fi movie, but I guess that's just a bonus.